Sometimes love arcs and dies in this living breathing sphere of ours and other times it goes on into the next, and the next, and the next. This is what I think about when I think of my first baseball game. This is why I need to know what year the Yankees played their season at Shea. If my dad were here, he'd know. He’d know in the way lifelong fans keep trivia and stats and he’d know in the way fathers keep sweet fleeting memories. I look it up. The answer is it was two seasons, 1974 and 1975. Yankee Stadium was being renovated and for both those years the Mets shared Shea stadium with their crosstown rivals. Instead of making their way to the Bronx,Yankee fans took the number 7 train to Queens, or, if you were like us, driving in from the sticks, took multiple highways, tunnels, and bridges. In 1974 or 1975 my father took my sisters and me to our first baseball game. It was always going to be a Yankee game, wherever that might be. Summers, when our father belonged to us in a way he didn’t during the school year, you’d find him painting a room, probably in a stifling corner of the house, drops of sweat running off his nose. There he’d be, listening to the game on a transistor radio that fit in his hand. It had a leather case with a perforated front over the speaker, and a small square pouch with a snap on the strap which held an earphone I never saw him use. If my dad’s transistor radio played anything other than Yankee games, I don’t remember. The static of those Yankee games coming through the transistor radio told the story. He wasn’t a New York City boy anymore. This was a standard joke of his, a kid from Staten Island living in Macungie, Pennsylvania. He’d rattle off our suburban subdivision address, ridiculous as they always are, and the room would laugh. Maybe the room was filled with Staten Island cousins who thought we lived in Nowheresville, but it could have been any room. My dad was wary of the world’s snap appraisals of class. It was his way of saying, sure, a house and a lawn is a step up, if you say so. He was out in front of the judgement, keeping himself, us, safe. My father was a fish out of water. That was the joke he was going to beat you to telling, and anyway he had been a fish out of water when he was in water. My father was a lot of things. He was a college football coach, he was a husband to his one and only love, a girl who grew up a few blocks away, but like so many neighborhoods in New York City, a few blocks was a thousand worlds. He was the father of three daughters, “All my dreams of thundering fullbacks in little skirts.” And here he was again, preempting the question, the question about whether he wanted a son. He did not want a son. He did not need a son. People say dumb things all the time. He was not going to let anyone ask that. It was typical of his gift for perceiving incoming pain and keeping it away. We felt it. Everyone did. Even now, when others try to explain why they loved my father, this is what they’re trying to say. The day his own father was buried, somewhere around his ninth birthday, they left him at the church. He was the altar boy for the service and when he came outside after putting his robes away, everyone was gone. The grim uncles, the wailing great aunts, the grandmothers, his mother, his brother, the neighbors, all of them, gone off to the cemetery. He waited for a while on the steps of St. Roch’s for someone to remember him and when no one did, he walked home. Baseball. The father, now dead, and the boy, now deserted, had gone to Yankee games every chance they could. It took a bus, a ferry, and a train to get to Yankee Stadium from Staten Island and every second of it was heaven. And then heaven was gone. It wasn’t hell, just earth. A common failure of the human heart is equating love with advice and this was especially true in large extended Italian families in the early fifties. A boy with a father who loved the Yankees became a boy with multiple uncles who told him sports were a waste of time. And college was a waste of time. The uncles wanted my father to take the test. The test was the entrance exam to the New York City Police or Fire Departments. He would not take the test. He went to college, the first in his family. He became the thing he listed next to his high school yearbook photo, a football coach. His passion for sports brought him to Macungie, Pennsylvania and a lifetime of Yankee games bathed in static. Was it a price? Yes. Is it sad? No. It was a good life. It wasn’t perfect, there were sorrowful days . . . but aren’t there always? It’s 1974 or 1975 and we are driving to Shea Stadium from Macungie, Pennsylvania so my father can take his daughters to their first baseball game. You could feel how important it was, how perfect he wanted it to be. Parents who sow their own memories on their children as outings to old haunts can come away disappointed, almost always, you can’t go home again. Baseball is an exception. It’s all the things you know, all the things you’ve heard about, all the ghosts on their best day. When the peanuts came, we ate them happily, dutifully, each of us amassing a mountain of shells on our laps. “No, no,” my dad encouraged, “just throw them on the floor,” but we would not. We could not. Finally, he told us that we’d be taking someone’s job if we didn’t throw those peanut shells on the floor and we relented, but the surprise and awe on my father’s face said it all. Daughter, daughter, daughter, and not one of us could litter like a New Yorker. So, there we were, a dad, his daughters, the Yankees at Shea Stadium. All of us fish out of water, breathing the Cracker Jack-scented air. 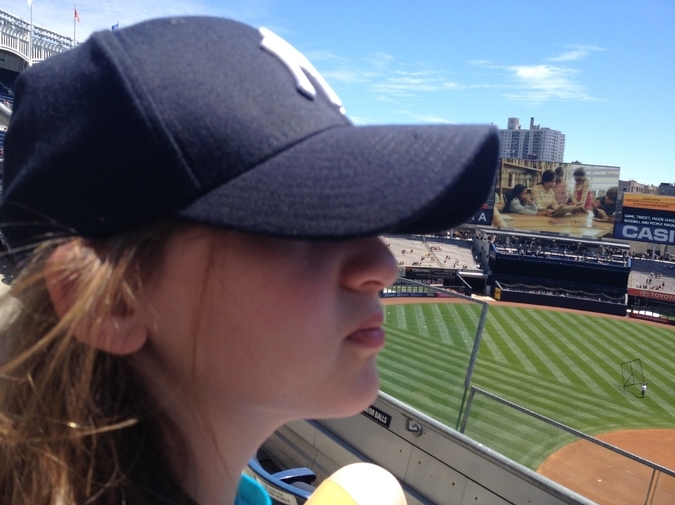 image: The author's daughter at her first game in the new Yankee Stadium. Photo by Chris Scalzo.